Headquartered in San Jose, California, and with assets of approximately $1.6 billion, Meriwest Credit Union serves over 80,000 members. Meriwest Credit Union, headquartered in San Jose, CA, has 12 branches and serves 80,000 members. With 30 years of experience in the financial industry, Mary Ellen Snider, Meriwest Credit Union’s VP of Compliance and Operational Risk, has seen it all. Her roles have been in operational risk, compliance, internal audit, vendor management and disaster recovery to name a few. She knows the value of program efficiency and continuous improvement. 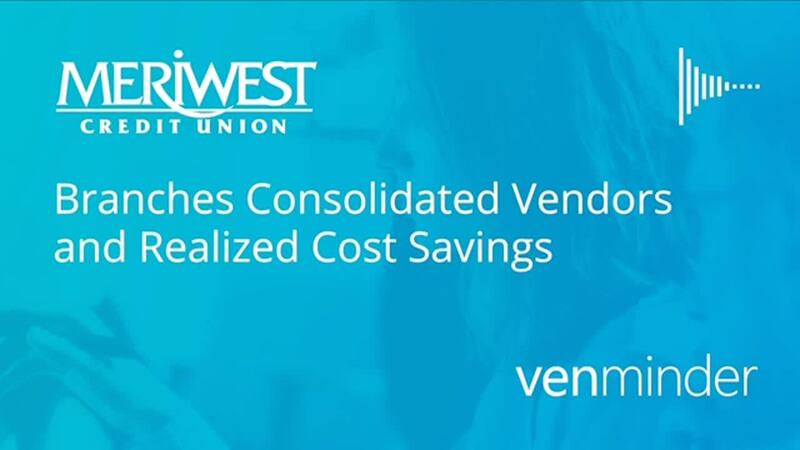 Prior to Venminder, Meriwest Credit Union used Excel to manage their vendors which became difficult to maintain. In addition, copies of contracts and related documents were stored in filing cabinets and, in most cases, maintained by administrative staff. This didn’t take into account the various contracts entered into and signed by department managers that management may not have been aware of. In many cases, co-workers had retired or changed jobs and over the course of many years the contracts had become almost impossible to track down making managing their vendors particularly challenging. “The spreadsheet is stagnant, and it can be manipulated. It doesn't send reminders of expiring contracts. It doesn't provide information on documents received or not received from vendors. And finally, it doesn't provide any reports, analysis or the expertise on how to manage the program,” shared Mary Ellen. Meriwest Credit Union knew that the method they were using to manage their vendors was dated and not going to be satisfactory to an examiner. The credit union decided they needed to outsource to a company who had a vendor management focus that aligned with their needs from a requirement and regulatory standpoint. The credit union chose to implement Venminder as they found it is the one-stop solution the institution was searching for. Since partnering with Venminder, Meriwest Credit Union’s approach to third party risk has changed greatly and has become much more organized. Examiners have also been satisfied with their vendor management program. By implementing the software features and outsourcing managed services, such as SOC and financial reviews, managing vendors has become much more streamlined, and they’ve also saved time and resources. Merwiest Credit Union would recommend Venminder to more than just financial institutions and believes any organization can benefit from the services.